Pharmaceutical co-packer sets sights on rapid future growth with proactive capital investment to boost its throughput capacity. Contrary to popular belief, the global pharmaceutical industry is not immune to the ups and downs of economic cycles and recessionary downturns, with its heavy emphasis on research-and-development often stretching financial resources of many of the Big Pharma’s leading global lights. With an average drug development process taking 10 to 15 years and about a billion dollars or more before commercialization, vigilant cost containment is a necessary requirement for to- day’s pharmaceutical and biotechnology companies—especially in light of intense pricing pressures brought about by fierce competition from generic drug-makers in recent years. 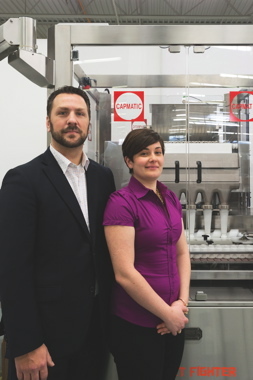 To save costs wherever they can, many leading pharma producers—as well as their generic competitors—are increasingly outsourcing their manufacturing and packaging functions to companies like the Montreal-based Fillab Inc.
Operations director Jean-Francois Paquin (left) and quality assurance and control director Adriana Malizia pose in front of the new Street Fighter tablet counting machine purchased by Fillab from Capmatic as part of a new turnkey bottling line installation at the company’s Montreal facility. 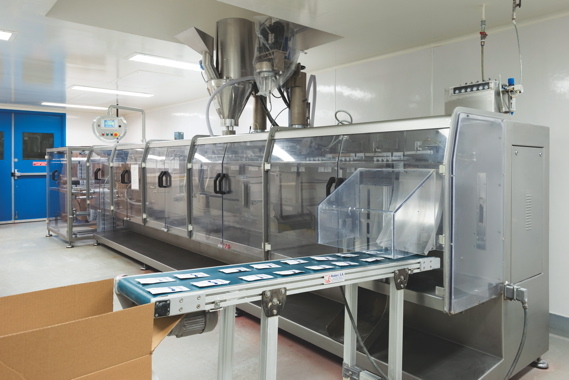 Operating out of a 20,000-square-foot production and storage facility in Montreal, the privately- owned company has been enabling many of its customers in the pharmaceutical and nutraceutical businesses to succeed with superior third-party manufacturing and co-packing services that let its clients concentrate on their core business of new product development. “Our production output has doubled in the past five years, and we are aiming to double it again in the next two to three years,” says Fillab’s director of operations Jean-François Paquin, explaining that the company, founded in 1988, had strategic-ally redefined its focus back in 2000 to cater primarily to the needs of the fast-growing generic pharmaceutical industry. 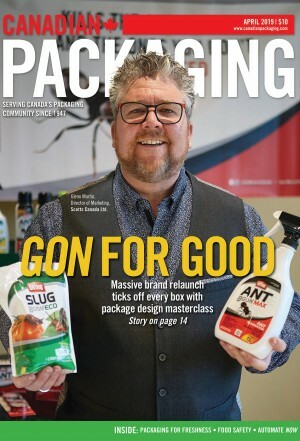 “Our main customers are pharmaceutical companies and natural product manufacturers who either don’t have any packaging capabilities or whose manufacturing volumes exceed their packaging capacity,” says Paquin. Blister Packaging. 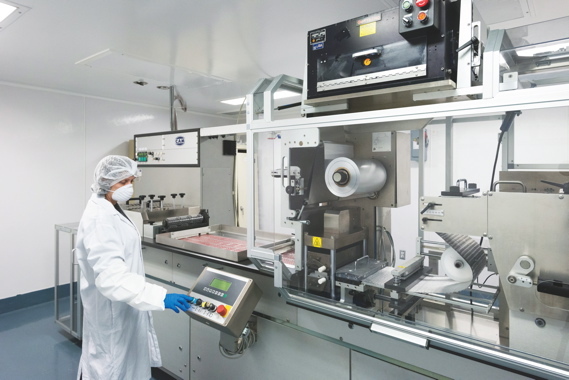 With throughput capacity of up to 60,000 blister-packs per shift, the 25-employee Fillab plant utilizes a broad range of tooling equipment and secondary packaging options and online printing to blister-pack a multitude of capsules, softgels and tablets in all types of PVC and foil materials, as well as pack them inside in an unlimited variety of folding carton/card/display designs. Powder Pouches. Widely used for cold medication powders and dietary supplements, the sachets produced at the Fillab plant are filled under nitrogen atmospheric conditions and controlled relative humidity for optimal product safety and integrity. According to Jean-Francois, the plant can produce between 25,000 and 50,000 sachets in a broad variety of sizes: from small- format sample sizes to large-sized pouches used for powdered nutritional supplements, with the added option to package two doses of different products into a single pouch. Tablet Bottling. 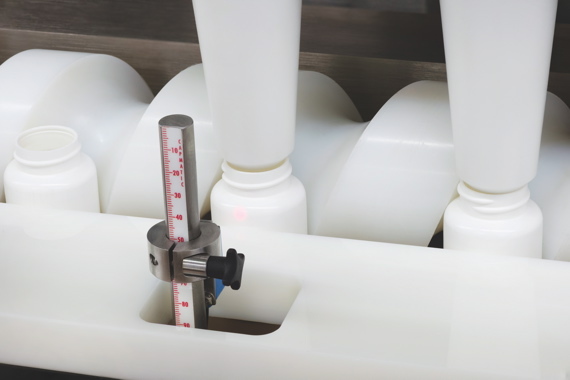 The plant’s high-speed, high- precision equipment provides a high degree of versatility in terms of counts, bottle shapes and labeling in one-, two-, three- or four-face labels, along with a wide choice of variation such as desiccant and cotton inserts; child-resistant, induction and perma-seal caps; inserts and outserts; and various-sized shrink packs. Liquid and Cream Packaging. 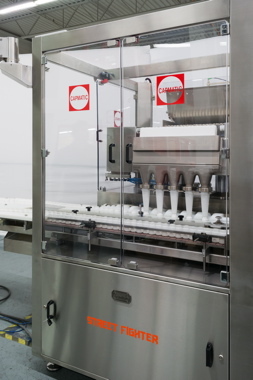 The plant’s bottling lines can process up to 15,000 bottles per shift, with container size ranging from five milliliters to one liter for products such as syrups, energy drinks, sunscreen lotions, e-cigarette juices (with dedicated pumps), etc. Boasting versatile capping and labeling options, the bottling rooms offer a wide choice of secondary packaging such as cartons, shrink packs and display trays, among others. Unit Dose Packaging. An assortment of single-serving packaging formats, including drinkable ampoules, for product samples and commercialization trials and studies. The Street Fighter tablet counter can achieve throughput speeds of 100 bottles per minute for 100-tablet bottles. 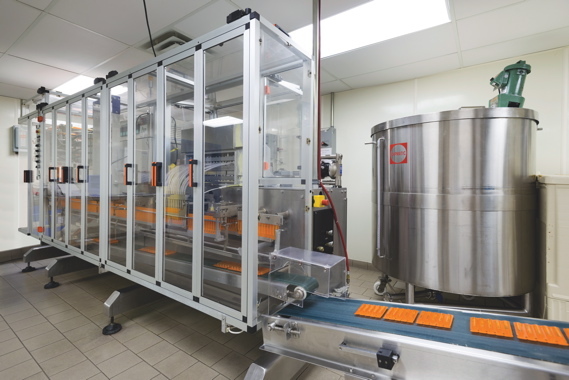 With speed-to-market and zero tolerance for error being two of the pharmaceutical industry’s prevailing requirements, Fillab is constantly upgrading its process flow and production equipment to stay on the leading edge, according to Paquin. Manufactured by the renowned Montreal-based packaging machine-builder Capmatic, the Street Fighter model SF-100 electronic counting system boasts the latest available technologies to ensure optimal accuracy and quality control. “Over the years we have identified a need in the pharmaceutical industry, especially in the generic market, for a reliable contract packager who would be able to deliver efficient services and meet the regulatory requirements at an affordable rate,” Paquin relates. “To that end, we made it our corporate mission to contribute to the success of our clients by offering them packaging services which are fast, effective, and offer the best quality-price ratio available on the market. “To date, our success has occurred by sticking to our mission and working truly in partnership with our clients,” says Paquin, citing scheduling flexibility as one of Fillab’s core competitive strengths. “We operate one or two shifts daily throughout the year, including weekends if needed, depending on the demand,” he relates. “Our whole operation is structured to enable us to employ a high variance of production workers on a very short notice. “In over 10 years of analysis, we have identified no recurring tendencies or particular cycle in the demand,” Paquin notes, “which is why we developed a structure that adjusts quickly to the changes in demand. “With our key personnel in place and our training procedures continually upgraded, we manage to go through our peak periods very efficiently,” he states. 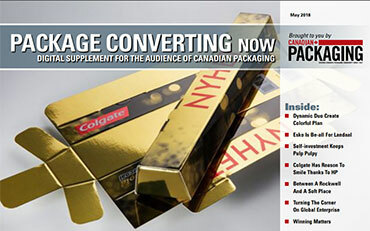 “This is the nature of our business as a contract packager: We have to be available when our clients need us,” Paquin stresses. “And that’s exactly what our clients really appreciate when they get to know Fillab,” says Paquin, noting that in addition to building a loyal Canadian customer base, the company has also been able to attract notable clients from the U.S. and across Asia over the last decade. 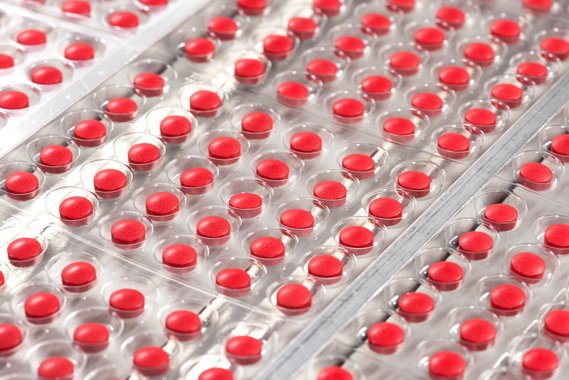 A close-up of tablets being counted and aligned for filling inside the Street Fighter SF-100 electronic tablet counting machine from Capmatic, which can handle a broad range of pill types and work with a variety of different container sizes and shapes at maximum throughput speeds of up to 120 bottles per minute. Nowadays operating six production cleanrooms, the company spent about a million dollars in various upgrades since 2000 to install a state-of-the-art HEPA-filtered HVAC (heating, ventilation and air-conditioning) system at the Montreal facility’s packaging rooms, followed by continuous machine upgrades to meet growing demand and fine-tune the facility’s fairly automated process. Machine operator making on-the-fly adjustments to the blister-packing machine boasting inline printing capabilities. 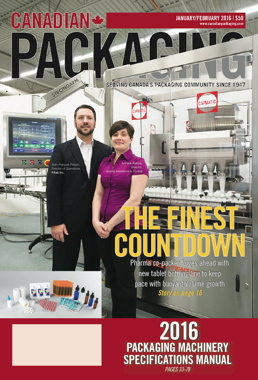 “To achieve a quick turnaround on a new project, our primary packaging is automated and the secondary packaging is mostly done through a semi-automated process employing strict inline quality inspection procedures and devices, such as checkweighers and inspection cameras, to ensure we meet all the pharmaceutical quality standards,” Paquin relates. Packages coming out of the high-speed form/fill/seal unit-dose packaging machine are conveyed into the shipping box. 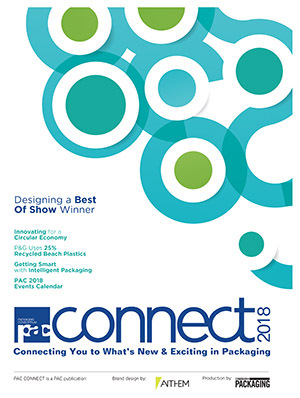 With demand for its services continuing to grow, last year Fillab’s management decided to make its biggest single capital upgrade to date, Paquin reveals, setting aside about $2 million for the installation of a new high-speed production line that would meet and exceed all of the industry’s cGMP (current Good Manufacturing Practices) quality management standards for years to come. 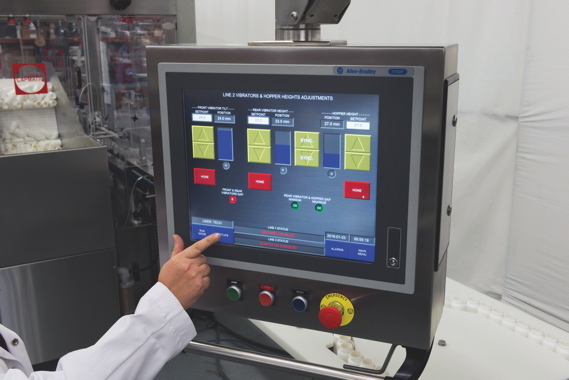 “To meet our needs in packaging volumes and regulation compliance, we decided to look for a high-speed tablet line which would include metal detection, cap presence and alignment detector, inspection cameras for labeling with serialization, and the latest technology available on the market for tablet counting,” relates Fillab’s director of quality assurance and control Adriana Malizia. 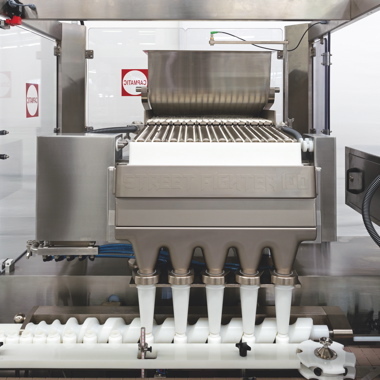 A high-speed, fully-automatic form/fill/seal machine used to produce the popular double-sachet packs (see image below) widely used for sample packs and promotional giveaways. “We wanted to ensure that our new line was equipped with the most recent technological advances in quality control in order to ensure not only compliance with Health Canada regulations, but also achieve the highest satisfaction and confidence levels among our clients,” Malizia points out. 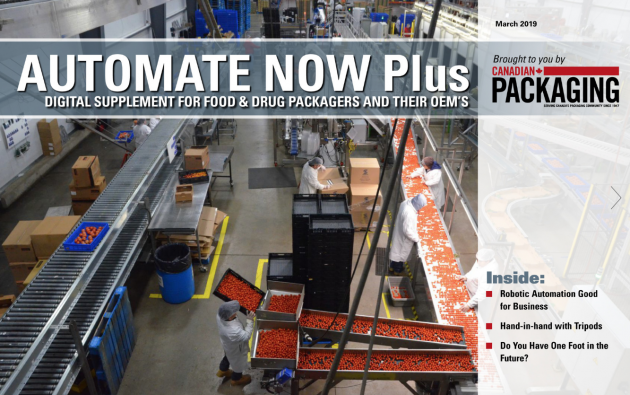 “To update our solid dosage packaging capabilities in a market that is continuously changing, we decided to seek the help of a reputable Top Tier supplier capable of providing us with a versatile turnkey solution. 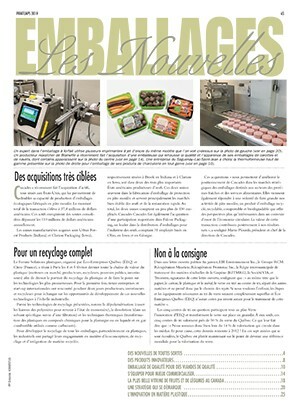 After evaluating available options, Fillab ultimately selected nearby packaging machine-builder Capmatic Ltd.—a well-established, highly reputable Montreal-based manufacturer of filling, capping, labeling and other automated packaging systems for pharmaceutical, healthcare, food and other key industries—as its supplier of choice. A close-up of the Street Fighter machine’s filling tunnel. The BandStar neck banding system for application of security seals. The Street Fighter uses the latest PLC (programmable logic controller) programming to ensure optimal process control. “Our decision came about fairly easily when we outlined our deciding factors for purchasing equipment with those key elements of quality, reliability and versatility,” Paquin remarks. Says Paquin: “This line can produce 100 bottles per minute for 100-count fills, which reassures us that our packaging needs will be fulfilled for many years to come. “Having this peace of mind is priceless,” Paquin asserts. “We are very proud to be able to say that we have a complete solid dosage packaging solution from one of the top companies in the industry. “This investment was intended to enable us to exceed the growing demand we face in this sector of activity, to remain consistent with our mission statement, and to be able to reach our goal of increasing our production output,” he expands. 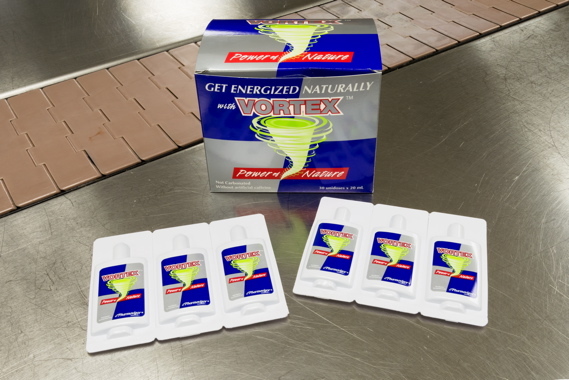 Close-up of blister-packs being formed at high speeds. Malizia concurs, adding she appreciates the Street Fighter counter’s inherent flexibility for handling various pill formats—including tablets, caplets, hard caps and soft-gels—along with a wide range of container sizes and shapes, with minimal change-over time requirements. As Paquin explains, “All our processes have been created to lead directly to our output. “In an industry as regulated as pharmaceutical packaging, we have to make sure not to get caught doing any additional process with no added value for the company.